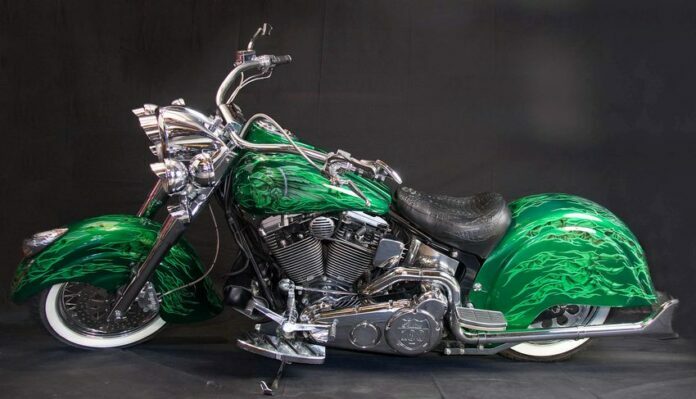 There are all sorts of modified motorcycles out there that are tweaked in some of the craziest of ways. Some can really make you confused as to why the owners chose to upgrade, or in some cases downgrade their bikes. 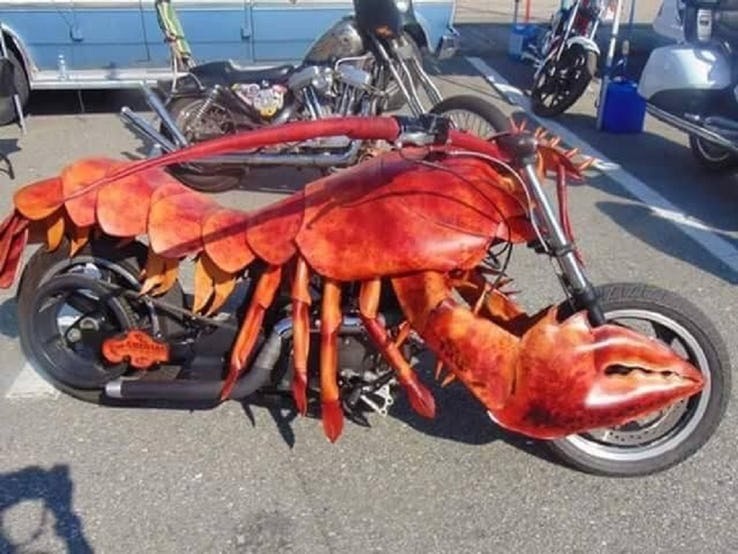 Following are some of the weirdest, most insane, and dumb modifications on motorcycles ever. 15. What the hell is this even? We are not sure what this is about. It does not even look like a bike anymore. Even that yellow flame does not work on it. Dual exhausts are always a gamble. This however is just taking it too far. And what about all the metal reinforcement holding it together, and the back tire? Why would anyone in their right mind do something like this? The owner probably has his own junkyard and had a lot of scrap metal to use somewhere. From a standpoint of awesomeness, this one gets a pass. Firstly, it really looks like it could easily outrun an F-16 until takeoff, the accent being on “looks”. In reality, it probably moves altogether, and has to be towed everywhere it goes. 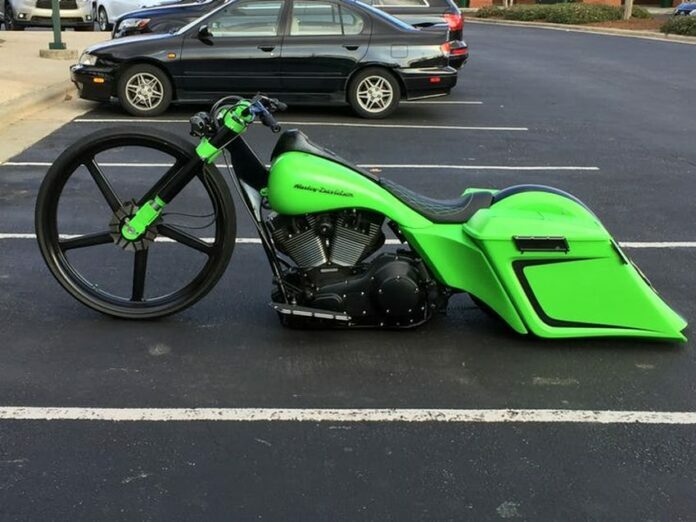 The designer probably had to do some major calculations to put all of those modifications in such a way that the bike stays up. Here is another head scratcher. Poor little Lambretta bike, it did not deserve this fate. Make sure to check out the little grinning face buried under all of the lights. What could be the purpose for all of this? It is not helpful in any way, nor is it practical. The “why?” is here to remain in this article. The large number of horns and side mirrors do not help at all. How do they even handle this weird bike on the road? 12. A bike or a car? This is a concept of modification you have probably seen somewhere already. We cannot set our mind on whether or not it works. This one looks like a hack-and-merge job, done by a crazy person in his back yard. We cannot even make out the car, as it could be a Caddy, or a Camaro. One thing is for sure: it is quite ugly. He at least has some major trunk space to bring all of his “crazy” with him wherever he travels. Ape Hangers are one of the things I will never understand, especially when they are this high. How does he drive it? How does he steer? That arm position has to hurt pretty quickly. The bike also looks awful with handle bars like those. The overall idea of ape hangers seems so unnecessary and impractical. He probably gets very tired on his rides. 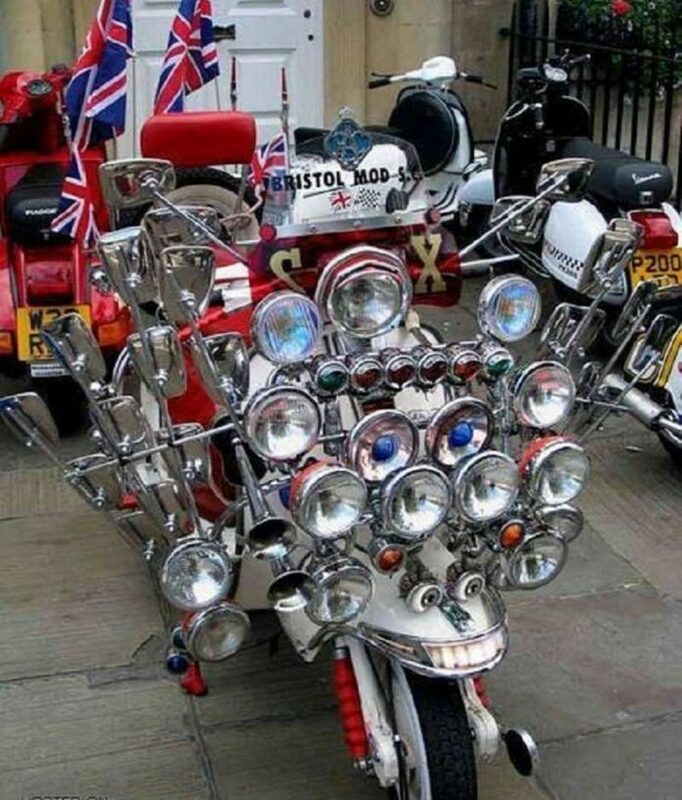 He probably has a way to make the bike normal when nobody is looking. Now look at this bad boy. Why would an owner choose the “Get Back Whips” mod? You are sure to get pulled over all the time with these hanging off your handlebars. These are supposed to represent your bike club and its colors. They also help to make the bike more visible when flapping around in the wind, in theory. These however look more like weapons to keep of riders who want to chase you down. This here is something different. 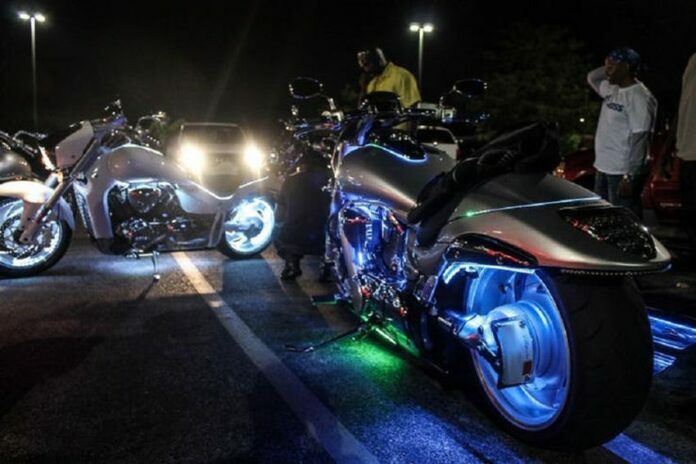 After the light show of one of the previous bikes and the overuse of lights, here we have the classic overuse of LEDs, which can make so many people go crazy. They do look expensive and well made, straight from an alien space ship. This one however overdose it. Too many lights, too many colors. The bike you ride should not look like a disco from the 1970s. You are lying if this one does not impress you. We are amazed for sure. The amazement quickly changes to asking why and how. 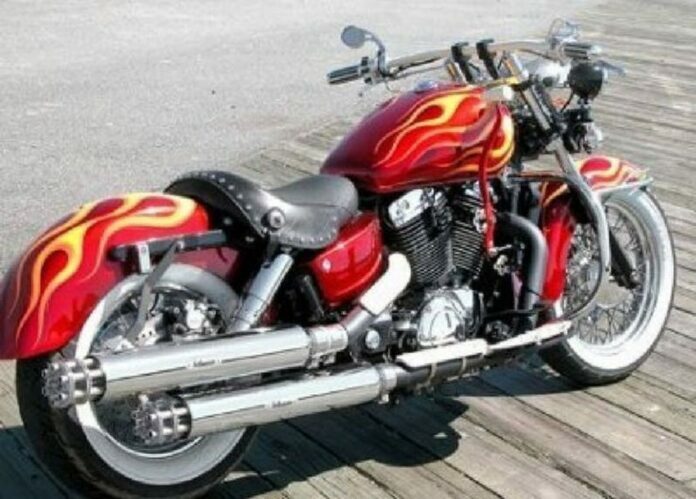 We admit that it takes a lot of guts to modify your hog like this. 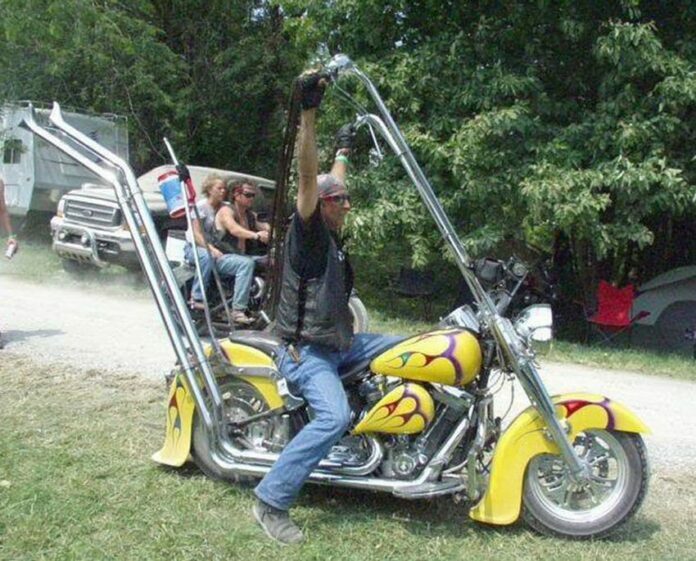 This has to be a huge and strong guy, because it is easy to mock a person riding this kind of a bike. Or he just cannot survive without shellfish and other sea critters. 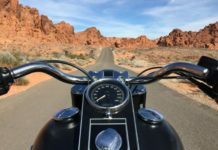 He may even be one of the people fighting for ocean preservation, and the bike helps him show it. Whoever he may be, he deserves props. It cannot be easy to modify a bike like this. The handlebars are the weirdest par however, as they seem so impractical. Now what is this you may ask? 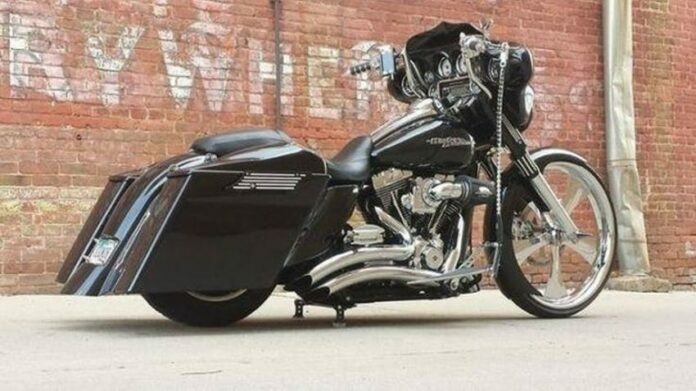 We want to know the same thing, as it says this is a Harley, but we just cannot believe it. Who has this as their bike of choice? It looks like a children’s bike. It also looks like it is not street legal. That front wheel and those handlebars look like a weird chop job from a regular old mountain bike. 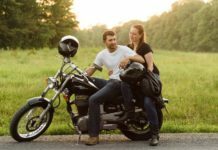 What is the purpose of the saddlebags? One thing it does not need is extra weight. We assume this bike is just for show, as it cannot be comfortable for rides, as it looks like it cannot get you places. One of the creators of the atomic bomb said “I am death, destroyer of worlds…” Here we see that the guy who designed this bike lives by the chilling quote. Or he just really likes Ghost Rider, or Skeletor. 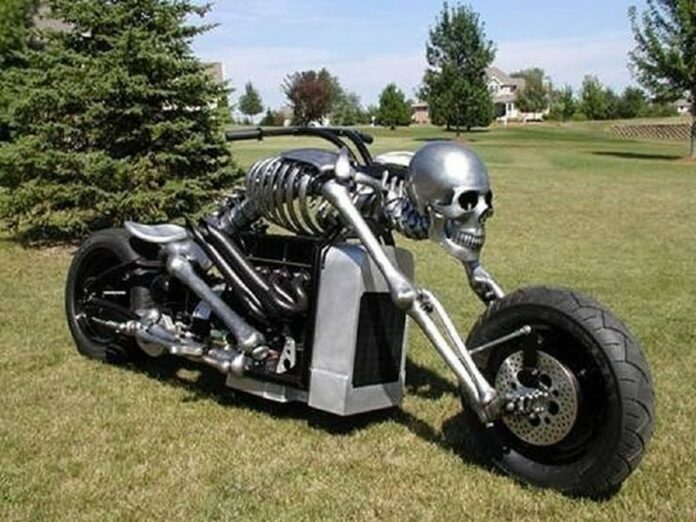 In any case, this is one creepy motorcycle, without a doubt. What it is as well is impractical, as it looks extremely uncomfortable to drive. While the tires look like they are capable of taking on anything, your bones would probably be all over your body from all the sturdiness. Ingenuity and imagination both get a plus, and we think the bike can serve as an awesome showpiece for various exhibitions and promotions. 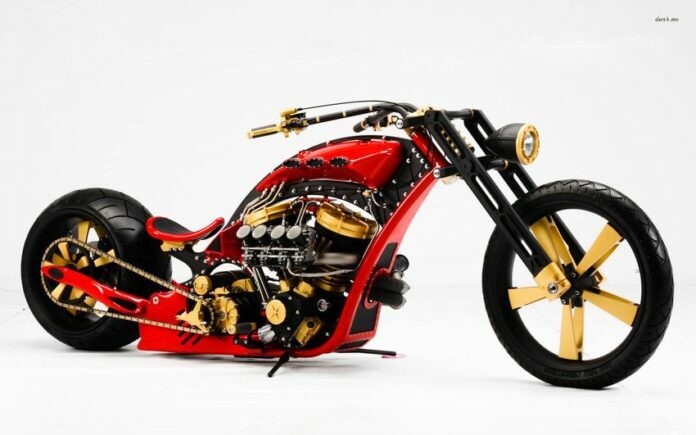 This nerdy bike is just straight up weird, and that is the end of the story. 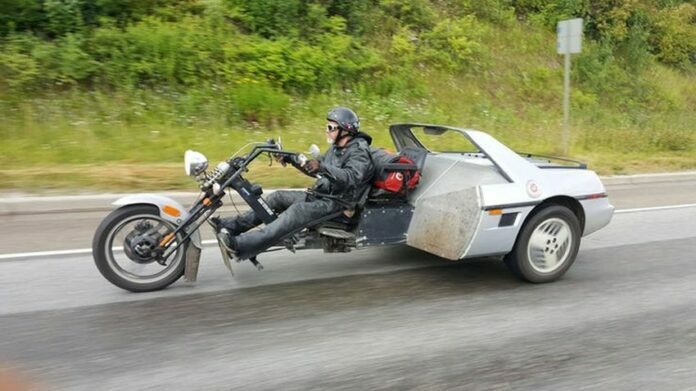 It looks more like a moped than a road legal motorcycle. Look how silly this thing is. It is actually a stretched Moped that wishes to be a motorcycle too bad. It seems completely uncomfortable and not at all drivable. Even the guys on the picture seem confused by it. The modified Mopeds just do not work. Let us leave it at that. 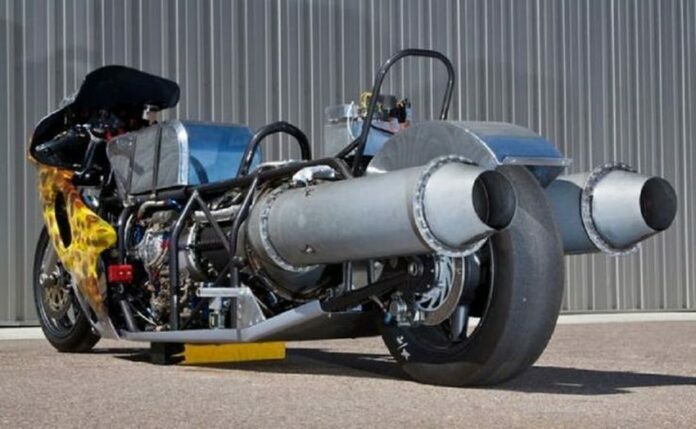 Someone familiar with this modification once said about the “Tail Gunner”, or Gatling gun exhaust pipes a bike: “Ever wanted to go for that extra 007 look on your Harley? Now’s your chance!” This however is more reminiscent of some of the 1980s and 1990s over the top action movies, like Rambo, or maybe even the G.I. Joe franchise. This is a silly thing to do to your bike, and best believe nobody is going to even think those are two real Gatling barrels. What is more, he had to have been pulled over at least once, as it may look suspicious to some police officers. Taking your whole youth soccer team to the field is great, and those can be some fun times on the ride. This is not the way to go though. Can someone please tell us what this is supposed to be? We are speechless. Why do something like this do it in the first place? Look at the little side wheels about two-thirds of the way behind the “driver’s” seat. Those probably came right after the bike first fell over after about 5 meters, and it cannot operate without the help. We also have to talk about turning. That thing is probably ten times harder to maneuver than a bus, towing another bus. This headscratcher seems like it could fall apart any second. It also looks photoshopped, and we actually hope it is. 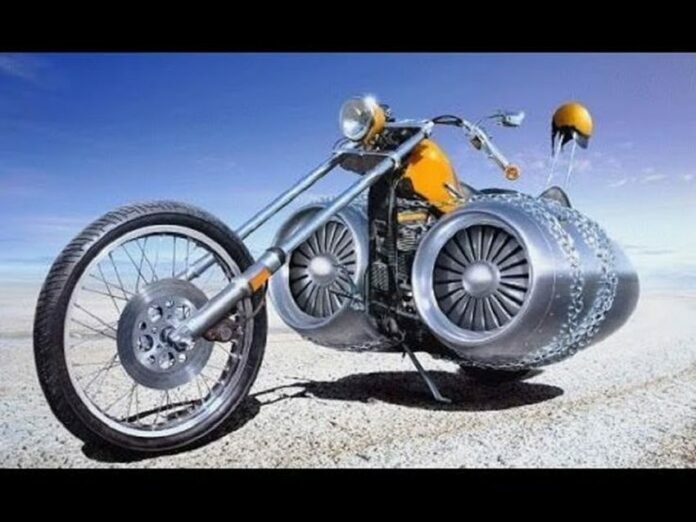 If you look at this from a Mad Max point of view, with all of the dune buggy freaks on acid, apocalyptic nightmare vehicles and heavily modified bikes, this actually looks kind of awesome. What it also is is a genuine headscratcher. We love the old, black and white photo that does not look edited. 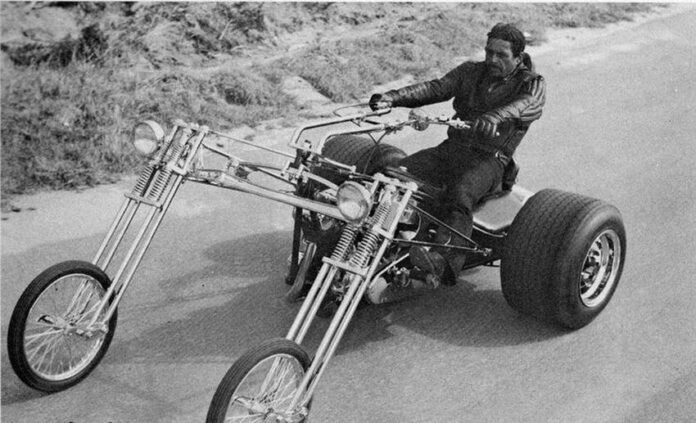 We really like the fact that the wonderful world of modifications on bikes has been around forever, and that people were as strange back then as they are today. Awe aside, this bike does not seem too safe. It also has to have a terrible turning radius, bad acceleration, and just awful performance-related features overall. 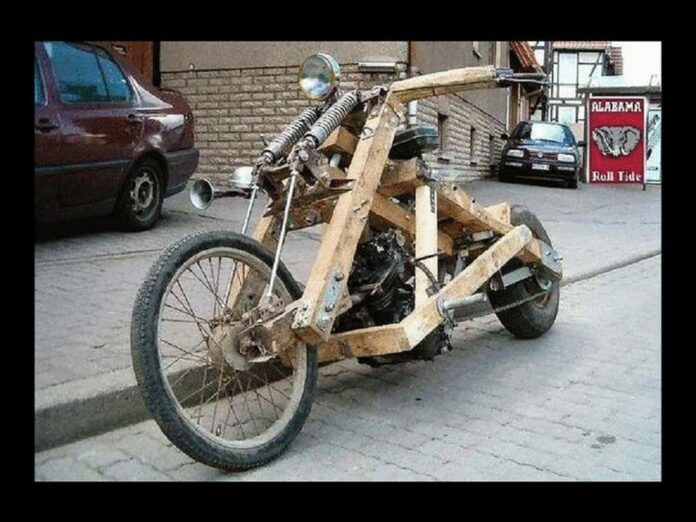 The final item on our weird list of modified motorcycles belongs to this incredible wooden motorcycle, barely held together by materials like plywood, carpet nails, and chicken wire. Take it all in, and appreciate the design and the artisanship. 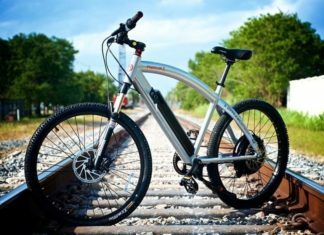 Do not bother thinking about how it works or why someone would do it, just appreciate the fact that you live in a day and age when someone thought this is a good idea for a bike. That Schwinn bike tire in the front, the bicycle horn on the handlebar, everything is just as crazy as it gets. All the important parts are exposed, it does not look safe or comfortable. It is one more of those bikes that have to be carried everywhere, after which they sit at one place for photographs. We know we would not risk riding on it. That was rough. 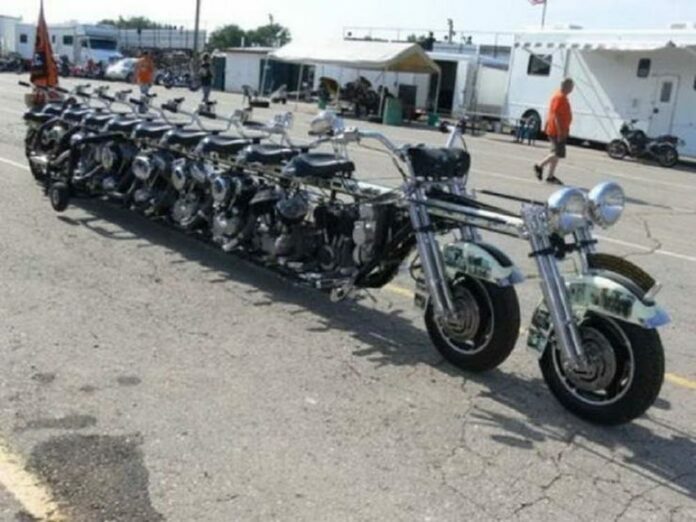 Which of these crazy bikes is your favorite?